No help at all – do it on your own. Read a book – self learning with no resource support. Watch a webinar – set topics and little time to ask public questions. Take a class – cookie-cutter education for a semester, that may not be focused on your industry or business. 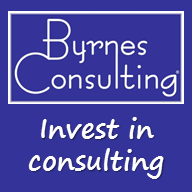 Hire a consultant – one who will learn your business and build a personal relationship to help you succeed. To go farther, a good consultant doesn’t just preach. Just like if you went to the doctor and he gave you a prescription before even hearing what was wrong, you probably wouldn’t get the help you needed. Open dialogue with real listening is what makes for a good consultant relationship. The answer depends on how much your business can potentially improve. Can just one idea from a consultant pay for the entire consulting engagement? If a short-term decision is implemented to make your firm more successful, how much of a compounding return on investment will take place over the next 3, 5 and 10 years? Compare the expense to what you would pay if you were to attend a university in your area. Note: As of 2/12/10, Boston College’s MBA program costs over $68,000. That is $3,660 per 3-credit class each semester.